High up the slopes of the Maum Turk Mountains in Connemara there is a natural passage way known a Máméan (pass of the birds). 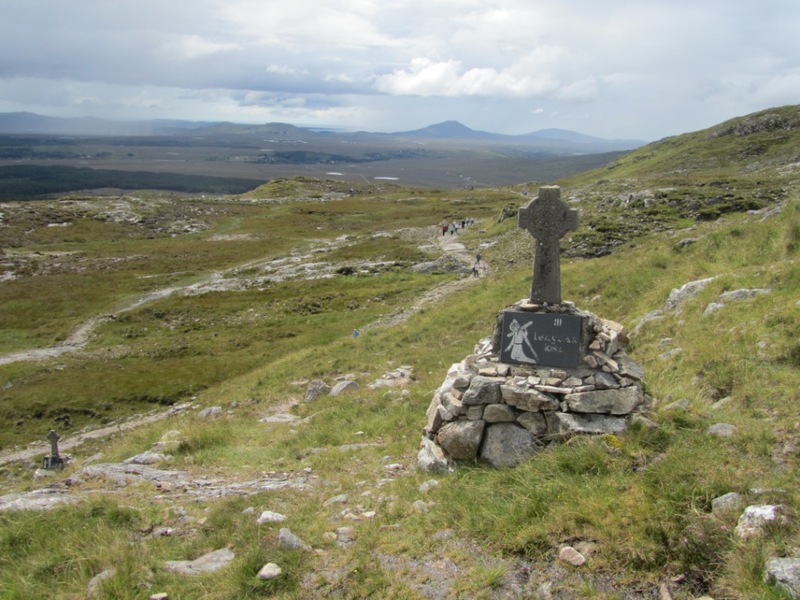 At the summit of this rugged track you will find an ancient pilgrim site dedicated to St. Patrick. The Maum Turk mountain range runs for 20 miles from Maam Cross in the south to Leenane in the North. 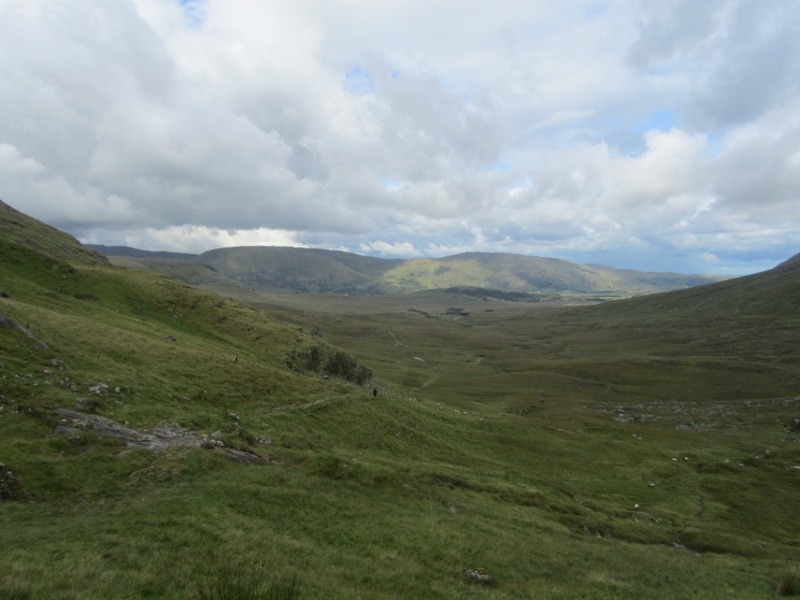 The highest peak reaches 703 metres with spectacular views of the Twelve Bens, Inagh Valley, Joyce Country and the mountains of south mayo . The Mámean pathway forms part one of the Western Way climbs. 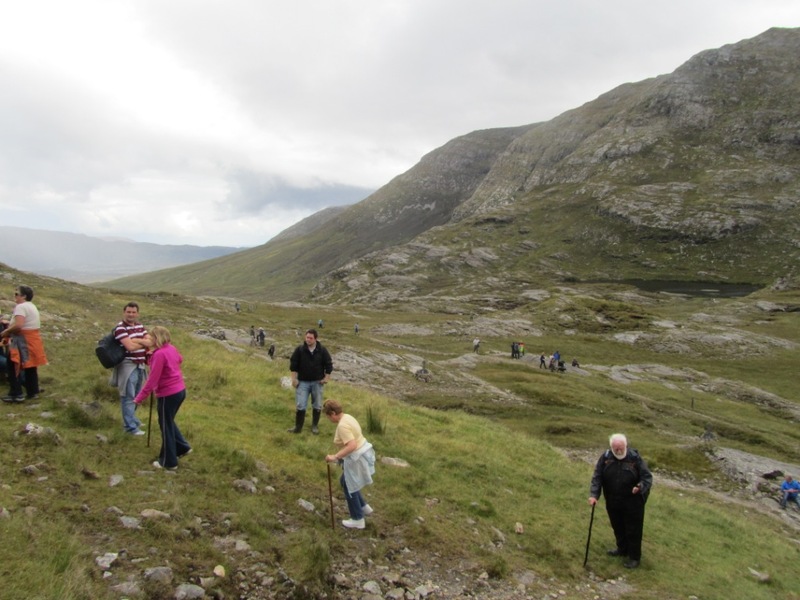 Legend tells of how St. Patrick on his travels through Joyce Country climbed Mámean and gave Connemara his blessing. Thirty miles away from Croagh Patrick the lesser known Mámean pilgrim site dates back to the 5th century. Pre-dating this time it is also associated with the Lughnasa festivals. Like many pagan sites it was Christianised and a great pattern day took place on the last Sunday in July or the first Sunday in August. The site is marked by a holy well, St. Patrick’s Bed; a cleft in the rock and a circles of stones representing the Stations of the Cross. Completing the shrine is a Mass Rock – used during the eighteenth century penal times when Roman Catholicism was outlawed. People gathered from both sides of the mountain to celebrate this day. The people of Connemara would ascend from Recess and the people of Joyce Country from Maam. Travel writers in the 19th century give us an insight into the event. Henry Inglis left us his account in 1834. He describes the groups of people moving up the mountain side. Older people gathered by the well and others around tents from which poiteen was served. ‘There were a score of tents or more – some open at the sides, and more closed; hundreds in groups were seated on the grass, or on the stones which lie abundantly there. 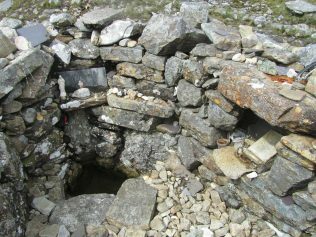 Some old persons were on their knees, beside the holy well; performing their devotions….I was warmly welcomed as a stranger by many who invited me into their tents. Of course I accepted the invitation; and the pure potheen circulated freely’. The pilgrimage fell into disrepute in the 19th century due to faction fighting and poiteen drinking. By the mid 1900’s it had almost died out. Fr. Micheál Mc Gréil with great local support was responsible for reviving the pilgrimage in the 1980’s. 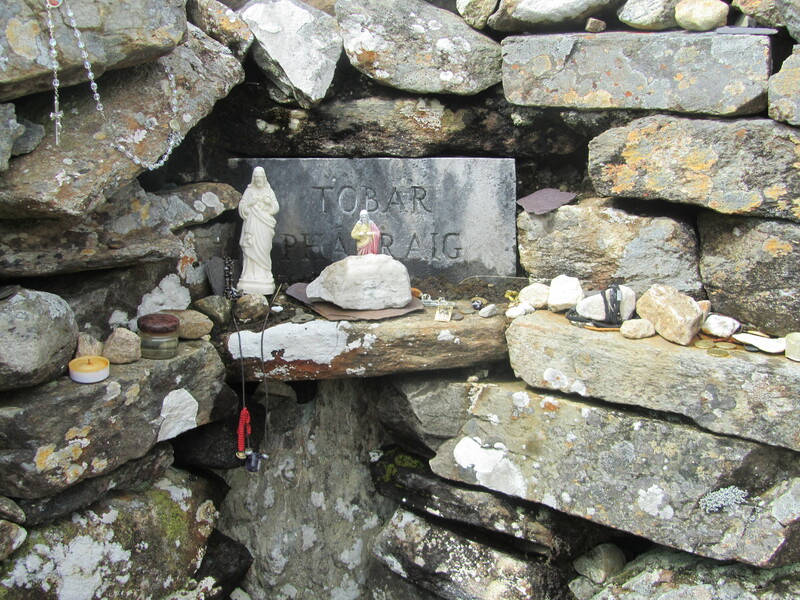 A small chapel was built beside St. Patrick’s bed and stone crosses were added to mark each station of the cross. A statue of St. Patrick depicted as a shepherd with a sheep at his feet was created by Cliodna Cussen in 1986. 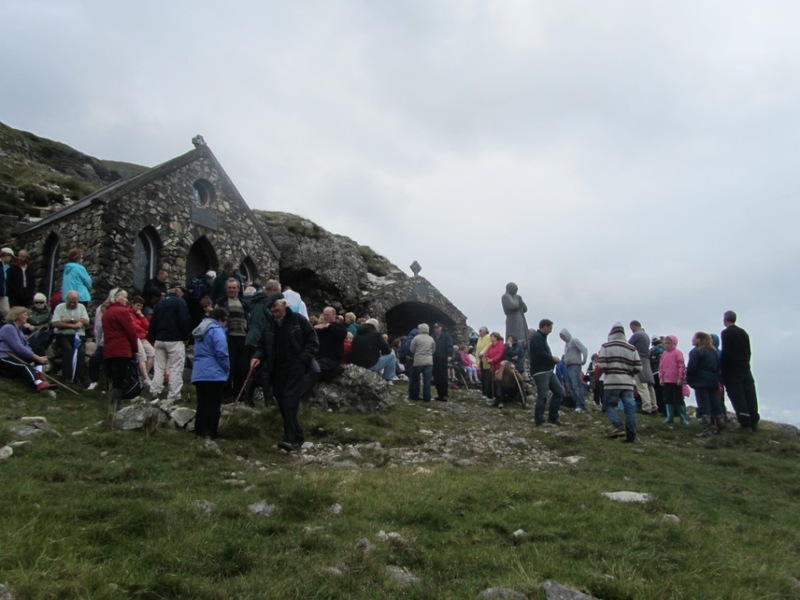 Today the Máméan pilgrimage is a more peaceful event compared to the 19th century. Fr. Mc Gréil and Fr. 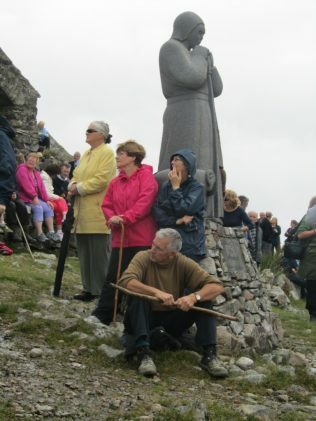 Fintan Monaghan organise the pilgrimages and events at Máméan. 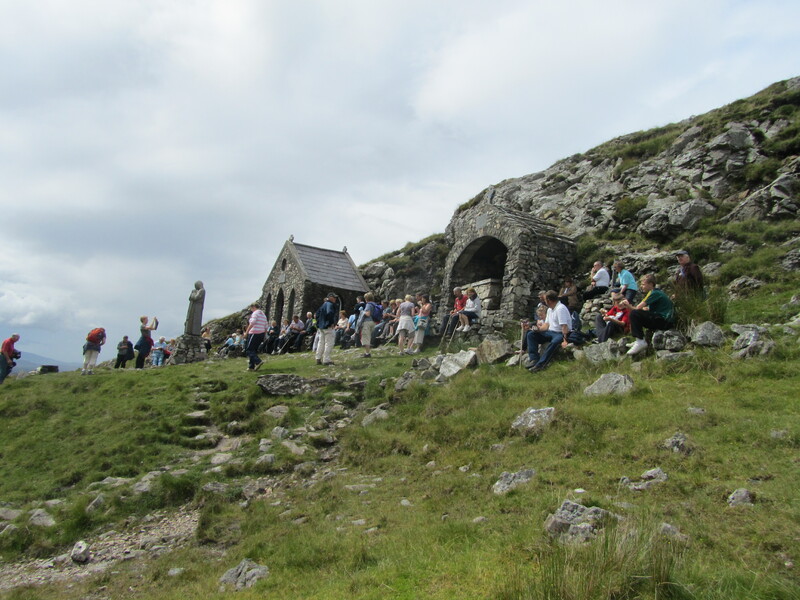 The pilgrimage takes place three times a year on St. Patrick’s Day, Good Friday and the first Sunday in August. People from both sides of the mountain greet friends and acquaintances at the site. One might plan to arrive early to take a rest, enjoy the scenery and have a chat. Some visit the well where a variety of objects are left behind as offerings including hair pins, lighters, keys and coins. Hill walkers pass through taking the Western Way track and the local Red Cross standby. Once the Stations of the Cross begin the crowd descends to total silence. A volunteer leads the stations carrying a white cross from one stone marker to the next. 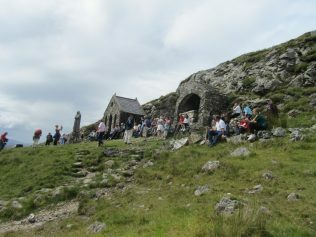 The mass takes place by the mass rock and the chapel. A local Seanachaí and couple of young musicians provide music and some sean nós dancing. Despite the often less favourable weather conditions, the crowds of young and old return to this high place every year. It’s so great to read about traditions that are being preserved and maintained by communities.